A question so thick with adventure, yet it causes some to stay frozen in time. But what if time were no longer linear? Memories no longer pure? What if someone changed so much of your past that you were no longer aware of your present? Trey stresses the senses and puts the world under a microscope. Why do we do what we do? Why do we like what we like? Why are we who we are? The questions that we are scared to answer, but ones that rest on the tips of our tongues. In a world where memories are stored in small leather-bound books, memories go from valuable to abrasive. Schools are forced to test practical skills over memorized material and the job market is saturated with identical candidates, all searching for the same high-paying jobs. When the first leather-bound book is stolen from the deep holdings of the American government, the world is flipped on its head. 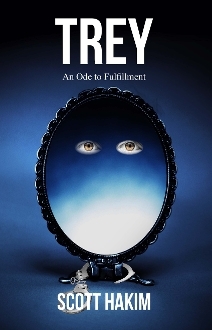 Enter Trey, a man lost in his own mind, at odds with the world since birth, and the man charged with finding the book and regaining order in the world. Trey must find the book that holds the key to his future purpose. But who writes the story? The key to his . . .